On the last Friday of every month, over 40 food trucks and 7,000 people gather for a night of local food and live entertainment. Every month, my husband and I race home from work, change clothes, and head out to Eat The Street. We have a few favorite food trucks that we love to visit, but we always like to try something new, too. Locals look forward to this event every month here in Hawaii. Free and open to the public, it’s the perfect way for any visitor of Hawaii to get a taste of the local food. If you are going to be on Oahu during the last Friday of the month, I highly recommend that you go. One thing I love about Eat The Street is that you can get all different kinds of food – from safe bets like burgers and pizza to dishes you may have never heard of before, including Hawaiian, Vietnamese, and Middle Eastern food. It’s also a child-friendly event, making it something the entire family can enjoy together. The first Eat The Street was held in 2011 in a small parking lot. Over 1,500 people attended, and many vendors ran out of food! The event was a much larger success than anyone could have imagined. We love local street food here in Hawaii. The event was so successful that an idea was born. Six years after the first event, Street Grindz partnered with Kamehameha Schools to move Eat The Street to a bigger location in Kaka’ako, which was the home of Eat The Street until March 2015. Six years running, Eat The Street is now located at Kaka’ako Park. 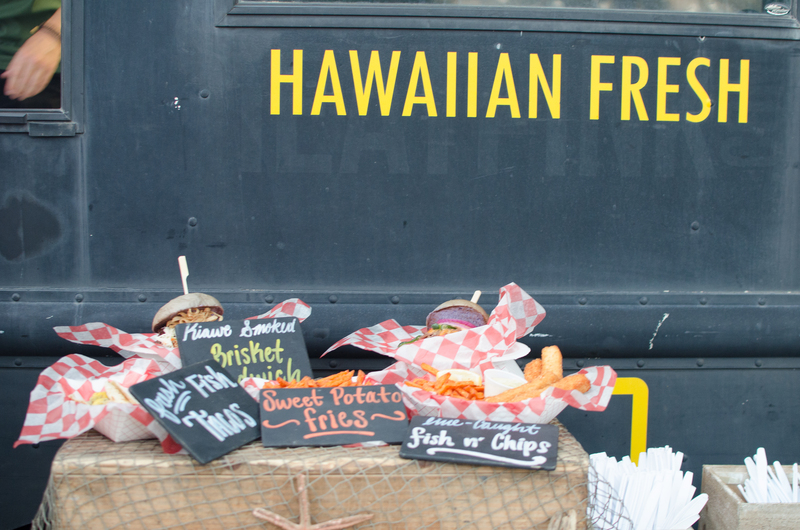 Locals come back every month for the best street food Hawaii has to offer. A few of the many food trucks that gather at Eat the Street. Come hungry and be prepared to share! There are so many different food vendors that you will probably want to try more than one thing. When I go with my husband, we usually order one thing, share it, and then go to another truck to do the same thing. Then we go to another and another, until we are full! That way we can each try more things. And if we really love something, we can always go back. 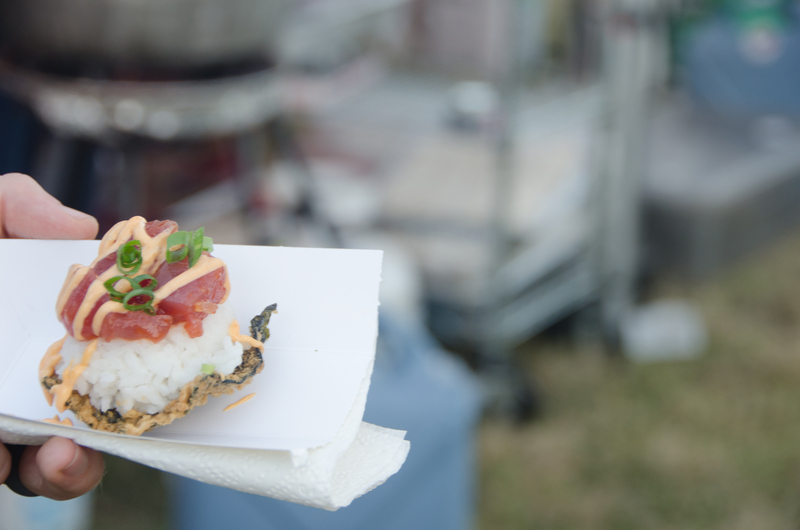 Eat the Street is the perfect place to try something new, like a piece of ahi musubi. There are always portable restrooms on site. Water and other drinks are available for purchase, but you will save some money if you bring your own water bottle. Many vendors accept credit cards, but some only accept cash. There are also ATMs for you to use. Each month there is a different theme. Last month, the theme was “spicy,” so many vendors had at least one dish that was spicy. But if you don’t like the theme, don’t worry! Vendors will be selling their usual food. The theme will be the inspiration for their “special” of the evening. 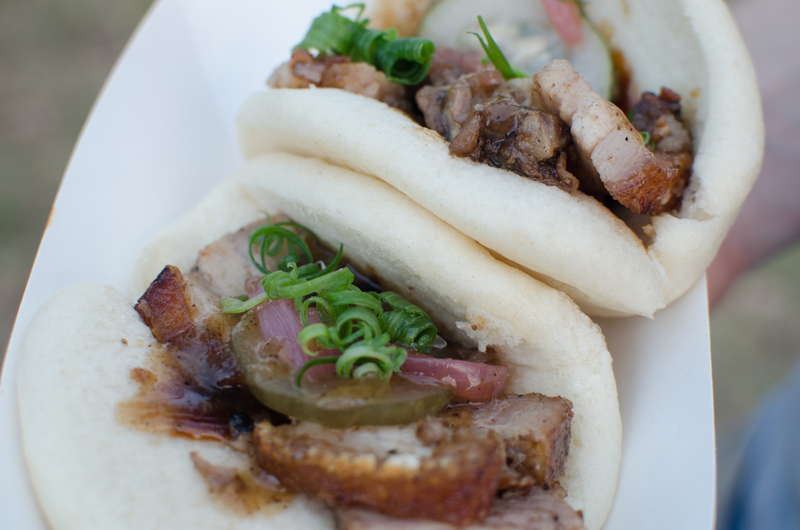 Tam Tam sold by Bao Taon at the last Eat the Street Hawaii. Many food trucks will have their dishes on display so that you can see them before you buy them. I usually walk around the entire event and look at everything before I make a purchase. Hawaiian Fresh Farms displays their menu at Eat the Street Hawaii. Parking can be found on the street or in surrounding area lots. For each event, Eat The Street updates its website and social media with parking information. If you prefer to Uber, Eat The Street has partnered with Uber to offer first-time riders a $20 credit using the code STREETGRINDZ. When is Eat The Street? 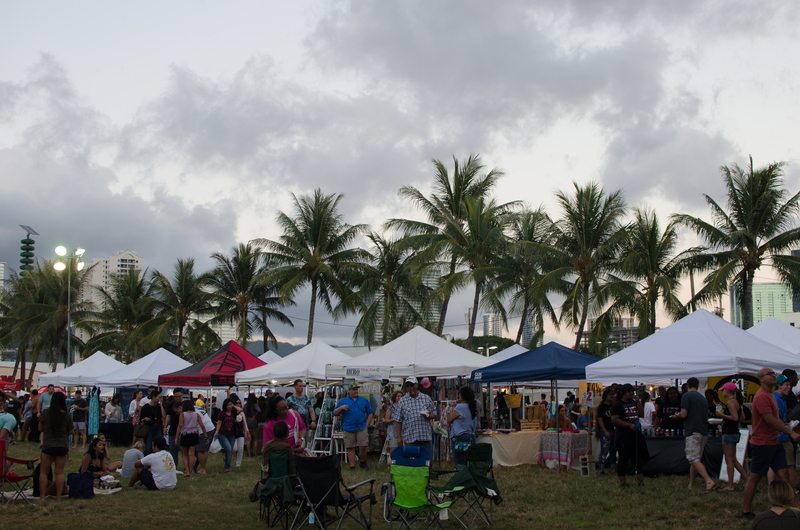 Eat The Street takes place on the last Friday of each month from 4:00 pm to 9:00 p.m. at Kaka’ako Park (747 Ala Moana Blvd). Eat The Street also travels to different towns around the island throughout the year. If you are planning a trip to Hawaii, follow Eat The Street on social media or sign up for their newsletter so you can find out about all the special events happening. Find them on Instagram @eatthestreet, Twitter, @eatthestreethi and on Facebook. The next Eat The Street will be in Street Pearl City on Saturday, July 15, 2017, from 1:00 p.m. to 7:00 p.m. It will take place in the Pearl City High School Gym Parking Lot, located at 2100 Hookiekie St, Pearl City, HI 96782. On-campus parking will be available for $3 per vehicle. Street parking is free. Check Eat The Street’s social media accounts for more information. Pro tip: Sometimes, last minute events pop up that you won’t want to miss, so start following them now if you are planning a trip to Hawaii. Your guide for this food tour will be celebrity chef Lanai Tabura. Lanai was born and raised on the island of Lanai and was the winner of Food Network’s “The Great Food Truck Race.” Lanai loves taking visitors to his favorite spots and sharing his knowledge of Hawaiian food and culture. Each food tour is unique and based on what’s fresh that day. Lanai also takes your preferences into consideration. Frequent stops include poke, seafood, food trucks, and local favorites like chicken katsu, lau lau, mac salad, and sticky rice. Don’t miss this once-in-a-lifetime opportunity to savor the flavors of Hawaii with a celebrity chef who has so much insider knowledge to share with you!